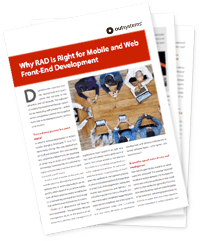 Home » Nieuws » Do You Know Why RAD Is Right for Mobile and Web Front-End Development? Enterprise IT teams are faced with a predicament. They’ve been challenged to create beautiful, highly-functional applications for front-end use, and they’re on a very tight timeline. The customer journey has changed – it’s turned digital and it’s faster than ever. Customers are demanding that enterprises keep up. How can IT be expected to deliver?